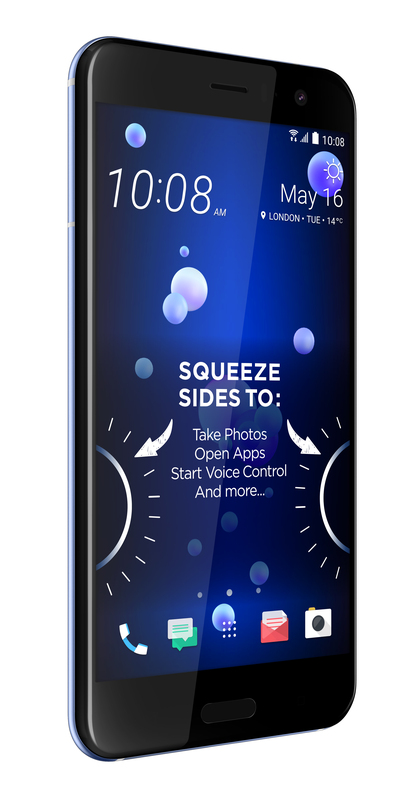 The headline feature for the HTC U11 is its new method of interaction: Squeezing. If you’ve encountered any of the marketing material on the device, it’s all about the squeeze. HTC’s new philosophy is that smartphones are stagnating: every generation is just a spec update to the previous model, and the only thing that drives the industry is related to new interaction methods and ways of streamlining the use of a device. Hence the squeeze: by holding the U11 naturally and squeezing between the thumb and the other side of the hand, the squeeze action will do a number of things. When the smartphone is turned on, the device will offer a calibration tool consisting of a few minigames (such as squeezing a balloon) in order to set the standard squeeze pressure. 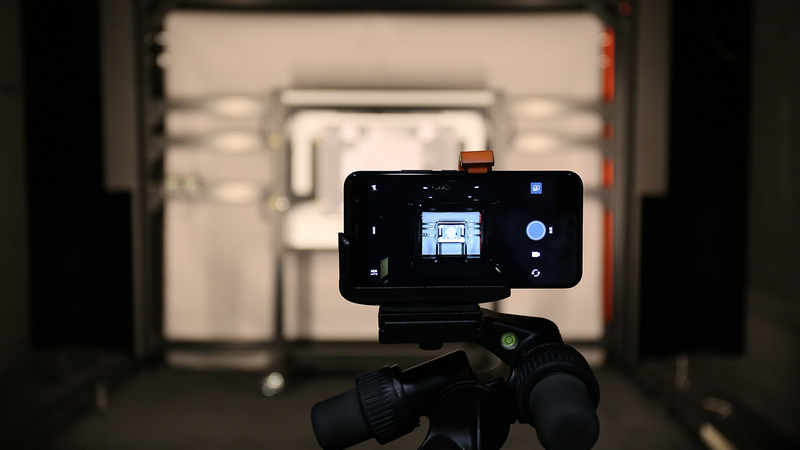 The mechanism supports two levels of squeeze based on time, and the calibration is done in order to determine a squeeze compared to a standard grip, which is one of the initial queries we had on the device. We are told that the squeeze is determined by an internal low-power ultrasound generator and detector. After the device is calibrated, it uses the phase of the reflected ultrasound waves for detection. When the device is squeezed, the internal shape will change enough to push the ultrasound wave out of phase, which can be detected as an activation. Software then determines if it’s a short or long squeeze, and carries out the required action. We’re awaiting internal images to determine what IC is being used and how this method is implemented inside the phone. HTC offered a number of possible options for the squeeze: squeeze to selfie, squeeze to take a photo, squeeze to push to talk, squeeze to load Google Assistant, squeeze to launch any app, squeeze to open the camera, long squeeze to change to front camera, etc. The squeeze methodology will be enabled in two stages; at launch, a number of stock apps will be preconfigured with squeeze actions, and some of these will be configurable at the system level. Then later in the year (we are told July) software will be made available that will allow users to configure any app to take advantage of the squeeze: it will detect which app is loaded, and the user can define the squeeze as if they were tapping the screen or long pressing on a button. HTC says Squeeze actions also work with gloves, so you can push to talk without removing your gloves to tap the screen. 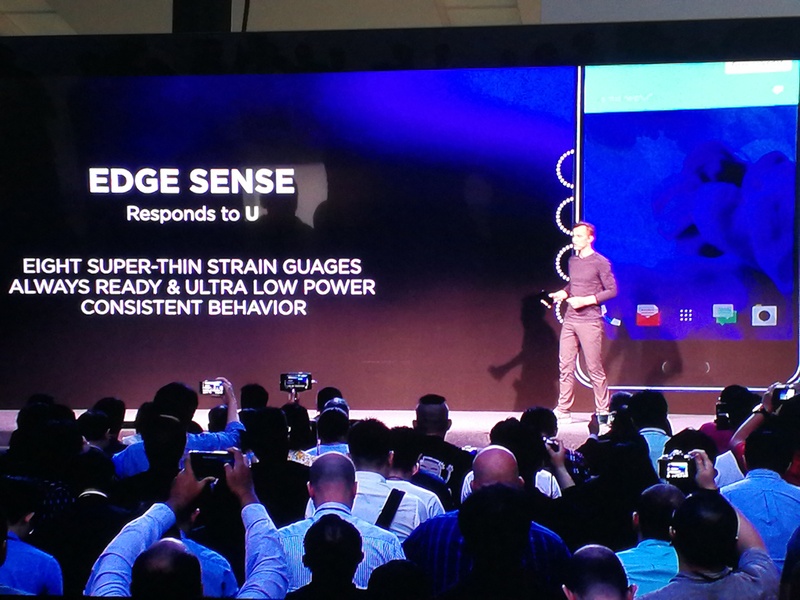 Edit: in the press event, we were told that the U11 uses eight super thin strain gauges to make the pressure measurement. 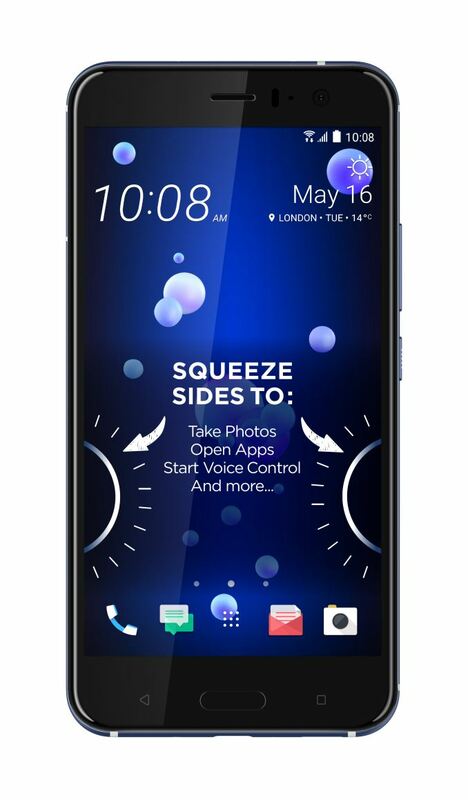 In addition to the new squeeze actions, the HTC U11 will also support voice interaction. It will ship with Google Assistant and receive Amazon Alexa support in July (at least in the US, UK and Germany). Having two different voice agents on the phone could get confusing, but HTC claims it will provide an easy method for using the correct one. 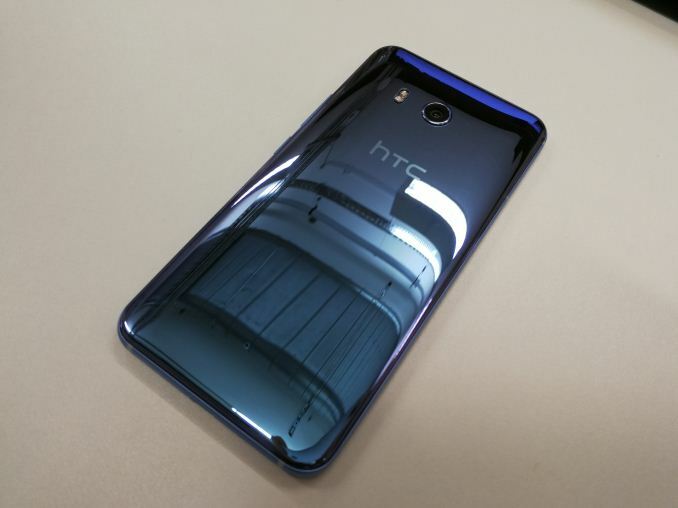 HTC sees a world with many assistants working independently instead of a single all-powerful assistant, which is why the HTC U11 includes both, with another assistant to be named during the official launch in Taiwan. 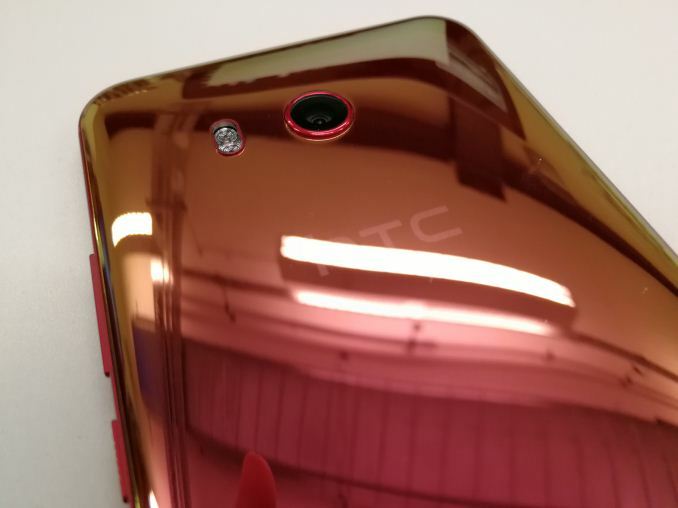 Rear Camera 12MP "UltraPixel 3" w/ OIS, f/1.7, 1.4µm pixels 12MP w/ OIS and laser AF, f/1.8, 1.55µm, 1/2.3"
The HTC U11 will be the third smartphone released with the Qualcomm Snapdragon 835 SoC, following the Galaxy S8 family and the Xiaomi Mi 6 in China. The U11 will be using the S835 worldwide, including the US, because of the Snapdragon X16 modem's network compatibility. There will be three different antenna configurations to improve signal reception depending on the user's geographic region, but each phone will be able to work in every region. According to the spec sheet, only one of the SIM slots is capable of LTE Category 16 (1Gbps) on the downlink, whereas the second SIM will be limited to Category 15 (750Mbps). The SoC is backed with either 4GB or 6GB of LPDDR4 RAM and 64GB or 128GB of storage, respectively. HTC says it's using UFS NAND, although due to supply issues it's unwilling to state categorically if it will be UFS 2.0 or UFS 2.1 at this time. In that instance, it’s best to expect UFS 2.0 and consider it a plus if you get UFS 2.1. The 4GB/64GB option will be available worldwide, while the 6GB/128GB version will only be available in select markets. Machine learning was another feature HTC discussed, specifically being able to determine which smart assistant a user will need based on context. The Snapdragon 835 SoC will assist, especially for inference, and the idea is that the smartphone will learn by interacting with the user in order to make the correct judgment. The U11 comes with a 5.5-inch QHD (2560x1440) SLCD5 IPS display, with fairly large bezels above and below. 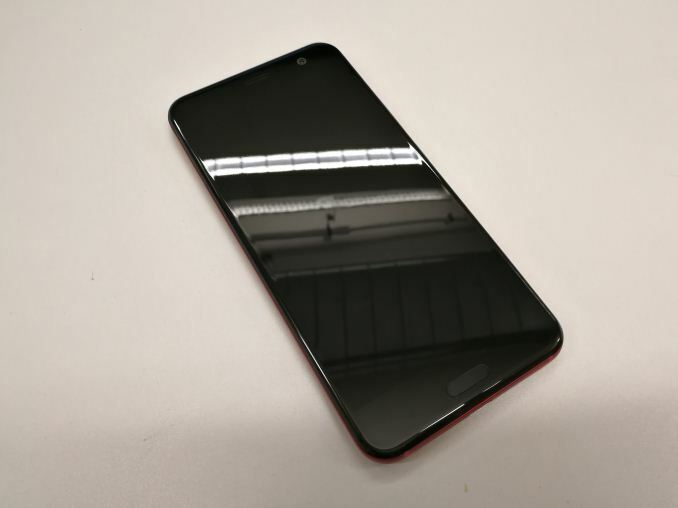 It’s a smartphone that certainly feels bigger than its 5.5-inch screen suggests, so users of 5.7-5.9-inch units won’t feel out of place. The larger bezels do help reduce false touches when holding the phone for a selfie or showing someone a photo/video, however (I’m not trying to spin bezels into a positive per se, but they don’t bother me personally that much). 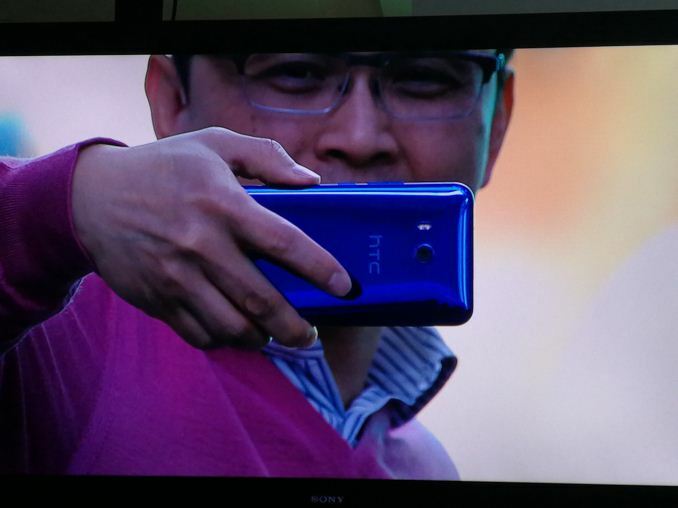 HTC says each display will be color calibrated at the factory, although it did not specify to what standard. There will be software options to make the color temperature warmer or cooler depending on personal preference, and there will also be an eye comfort mode. One of the top features will be the IP67 water and dust resistance. In the flagship scene, some phones are perennially water resistant, while some flagship families will ignore the feature and others will flip-flop between them. There are tradeoffs when designing a smartphone to be water resistant, including seals and their affect on future repairability (most water-resistant smartphones get a super-low iFixit score, for example). Nonetheless, there are a number of users that will only ever buy a water resistant phone, and HTC advertises the IP67 rating for the U11. The touch screen is also configured to work when wet, and the squeeze actions work with gloves as well. The U11 will have always-on microphones that capture audio from up to 6 feet away and consume only 1mA. The microphones are also advertised as "50% more accurate," although it was not specified what it was being compared to. The software supports a voice unlock feature that allows different users to unlock the phone with their voices and integrates with Google Assistant. 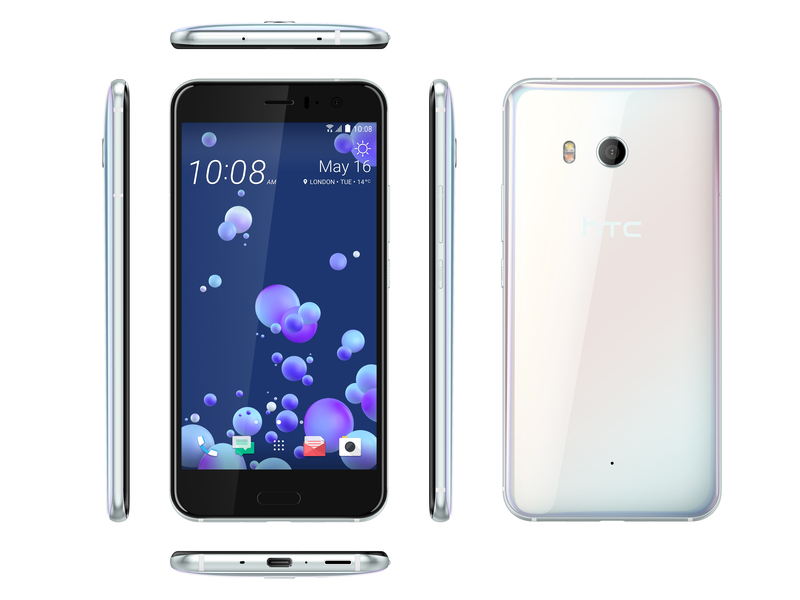 The U11 will use HTC’s latest edition of BoomSound high-performance audio too, with a new ‘Hi-Fi’ variant. HTC is claiming more power with this new version, where the chassis acts as a resonance chamber, supplementing the external speakers. We were shown a pseudo diagram of how the ‘whole phone as a resonant chamber’ is meant to work, and through a tour of HTC's labs we were told that this comes down to one of the speakers using the inside of the phone as its resonance chamber. Alongside BoomSound is HTC’s USonic USB-C audio technology (sorry, no 3.5mm headphone jack) that performs echolocation inside your ears to determine customized EQ settings that match the headphones with your ear structure. This is a profile set on the phone when using the HTC headset, and can be saved to the cloud for use with future HTC devices. HTC will bundle a USB-C to 3.5mm audio adaptor with the phone, and HTC will also offer a special adaptor with an integrated high-performance DAC in the cable. The rear camera uses a 12MP UltraPixel 3 sensor with 1.4 micron pixels, where each pixel can assist with phase-detection auto focus. It supports both OIS and EIS and comes with an f/1.7 lens assembly, which is one of the smallest f-stop values currently available on a smartphone camera. The camera supports a pro mode with manual control as well as slow motion video (1080p120) and 3D Sound recording. 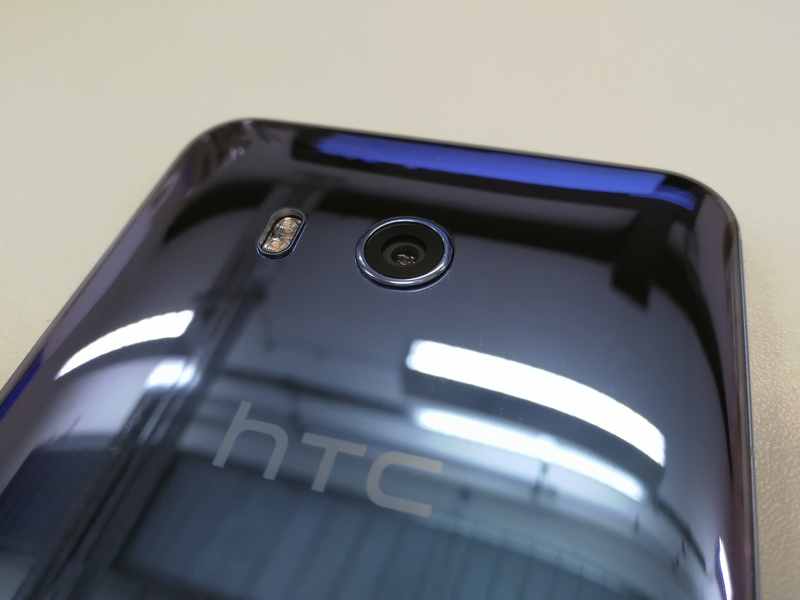 HTC is keen to promote that it scores 90 in DXOMark. The front-facing camera is also an UltraPixel sensor (it wasn’t stated which version), coming in at 16MP with a 150-degree wide-angle lens designed for "better selfies in low light." 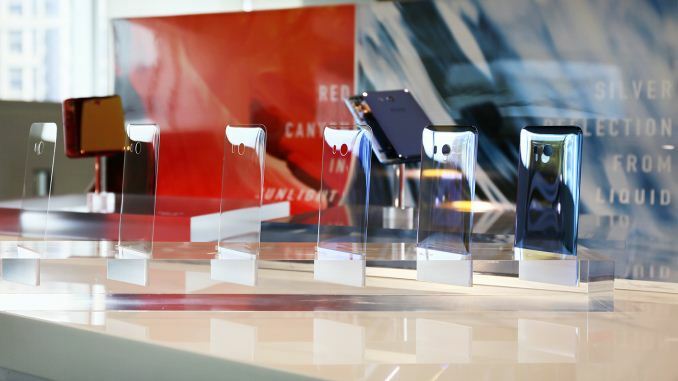 For its "liquid surface design," which mimics the visual properties of a liquied, HTC covers both the front and back with Gorilla Glass 5. 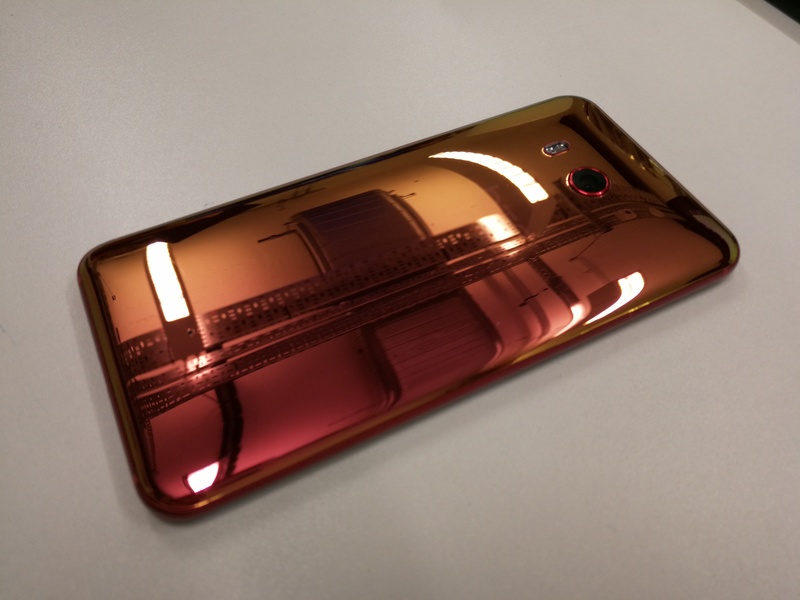 The manufacturing process that adds color into the 3D glass is called "Spectrum Hybrid Deposition," and in the devices we saw it gave them a very shiny and metallic look (it also attracts fingerprints very easily). Five colors should be available at launch, but may be region dependent: Ice White, Brilliant Blue, Sapphire Blue, Solar Red, and Amazing Silver. The last two will have special properties – the Solar Red will shift from a bronze color to a red color, depending on the angle you see the device, and the Amazing Silver will do something similar. A clear case will be provided in the box. The battery will come in as 3000mAh, and rather than promoting any length of time for standby or use, HTC is claiming a 45% increase in Web browsing time over the previous HTC flagship along with 24 hours of talk time. This will likely be down to the more efficient SoC, but efficiency changes in the display are likely to have an effect too. The chipset will support Qualcomm’s Quick Charge 3.0 as well. There is not any wireless charging, as HTC is waiting for the technology to develop further. Pricing for the U11 is expected to be announced at the launch event (see our live blog), although we were told to expect to see the 4GB/64GB edition to come in at £679 in the UK (approx. US$800 without tax). Well, squeeze it if you can, I don't have gigantic hands, so I won't be squeezing this one. I don't understand how come one of the best selling phones in the world (iPhone 7) doesn't have a similar sized competitor in the Android world. The case part of the comment applies to every single flagship (and not only) on the market. Manufacturers do their best to make the phone as this, shiny, and fragile as possible in the name of design. Then you have to slap on a case to make the phone grippy enough, usable, to protect the very fragile backs and screens, etc. Cases allow people to personalize the design. Thin allows the cases to add a few mm without the result being too thick. Shiny design allows the case to have cutouts at various points (if that's what you want) to show the shininess. You do make a good point but I would suggest that making a phone that, by design, needs a case (to the point where it ships with one) is a little excessive. I would also suggest that phone manufacturers should perhaps focus on durability before design and if you want a pretty looking phone you should get a cheaper pretty looking case that can get damaged without costing the earth to replace rather than being almost mandated to get one if you don't want it to shatter on its first interaction with the floor. I'm sure that HTC have gone with what their market research shows and you're probably correct that most people want a pretty phone. Unfortunately these are the same people who walk around with an iPhone with a shattered front / back panel. I would say that the majority of iPhone owners I know have cracks in their devices due to this obsession with glass and "ooh, shiny shiny". That would be like saying, "All these coffee-table companies are making sharp corners, but then you have to slap foam on all the sharp edges so that when you smack your head on them you won't kill yourself!"